Walmart helps people around the world save money and live better -- anytime and anywhere -- in retail stores, online and through their mobile devices. Each week, more than 245 million customers and members visit our nearly 11,000 stores in 28 countries and e-commerce websites in 11 countries. 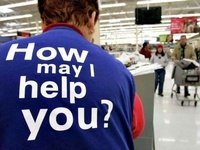 Walmart employs 2.2 million associates worldwide.